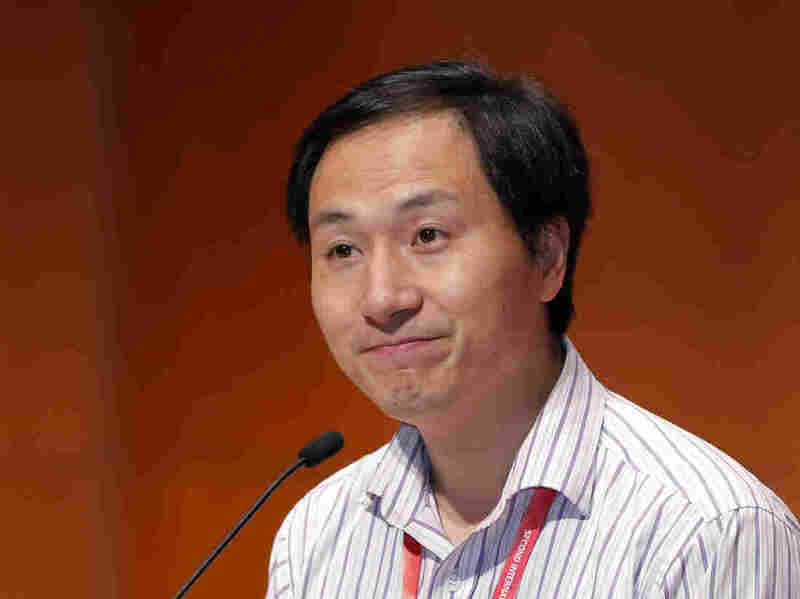 Chinese Scientist He Jiankui Rebuked By Colleagues Over Gene Experiments : Shots - Health News He Jiankui, who shocked the world by asserting he had genetically edited twin girls, faced growing criticism from other researchers as he spoke at a scientific conference in Hong Kong. Researcher He Jiankui spoke Wednesday during the 2nd International Summit on Human Genome Editing in Hong Kong. Earlier, He surprised the scientists just as they were gathering for the meeting with his claim, which he outlined in a series of YouTube videos. With the announcement, He bypassed scientific norms of first subjecting his experiment to scrutiny by other scientists. "First, I must apologize that this result was leaked unexpectedly," He told some 700 attendees. "This study has been submitted to a scientific journal for review." 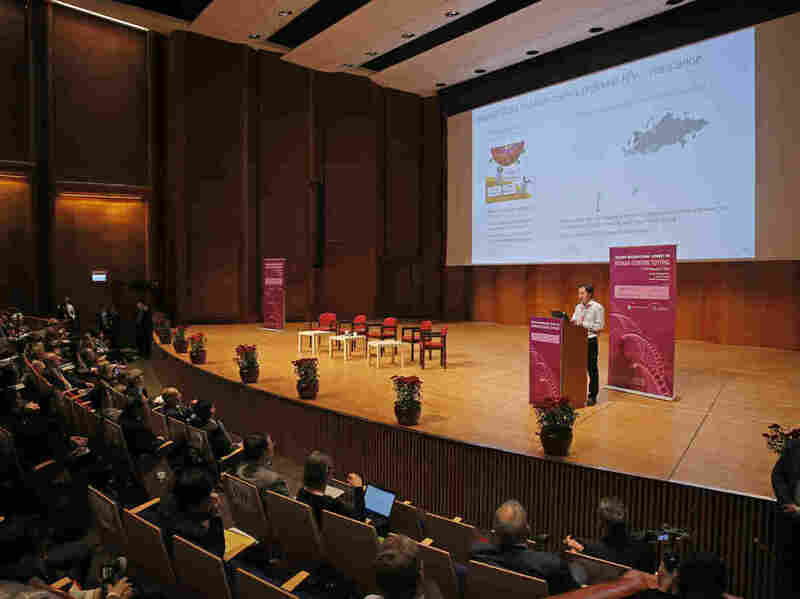 He faced a skeptical, incensed audience at the 2nd International Summit On Human Genome Editing, which was organized to try to reach a global consensus on whether, how and when it might be permissible to create children from genetically altered human embryos. In yet another unsettling revelation, He said that "there is another potential pregnancy" involving a gene-edited embryo, but that it is still at an early stage. As soon as He finished his initial 15-minute presentation, American Nobel Prize-winning biologist David Baltimore, who chairs the conference, got up to speak. Baltimore noted that scientists had agreed that it would be irresponsible to try to create genetically modified babies until there was much more research to make sure it was necessary and safe and until a consensus had been reached that it was prudent. "I don't think it has been a transparent process," Baltimore said. "We've only found out about it after it's happened and the children are born. I personally don't think it was medically necessary." "I think there has been a failure of self-regulation by the scientific community because of a lack of transparency," he added. University of Wisconsin bioethicist Alta Charo, who helped organize the summit, issued an even harsher critique of He's work, calling it "misguided, premature, unnecessary and largely useless." "The children were already at virtually no risk of contracting HIV, because it was the father and not the mother who was infected," she said. "The patients were given a consent form that falsely stated this was an AIDS vaccine trial and which conflated research with therapy by claiming they were 'likely' to benefit," Charo said. "In fact, there is not only very little chance these babies would be in need of a benefit, given their low risk, but there is no way to evaluate if this indeed conferred any benefit." For the first time in public, He Jiankui defended his gene-editing research involving twin babies who were born last month. Other scientists rebuked him. She spoke after Harvard Medical School Dean George Daley alluded to He's claims as "missteps" that he worried might set back a highly promising field of research. "Scientists who go rogue carry a deep, deep cost to the scientific community," Daley said. Still, Daley argued that He's experiment shouldn't tar the potential work of other scientists. "Just because the first steps into a new technology are missteps doesn't mean we shouldn't step back, restart and think about a plausible and responsible path forward," Daley said. "The fact that the first instance came forward as a misstep should in no way leave us to stick our heads in the sand and not consider the very, very positive efforts that could come forward," Daley said. "I hope we just don't stick our heads in the sand." Daley stressed that the world hasn't reached a scientific consensus on how to ethically and safely use new gene-editing techniques to modify embryos that become babies. But Daley argued that a consensus was emerging that "if we can solve the scientific challenges, it may be a moral imperative that it should be permitted." The most likely first legitimate use of gene-edited embryos would be to prevent serious genetic disorders for which there are no alternatives, Daley said. "Solving and assessing these deep issues [is] essential," Daley says. Daley also defended the fact that scientists have long relied on self-regulation to prevent the abuse of new technologies. He's claims represented "a major failure" that called for much stronger regulation and possibly a moratorium on such research, Daley said. "I do think the principle of self-regulation is defensible." He and his colleagues say they used the gene-editing technique CRISPR to make changes in day-old embryos in a gene called CCR5. The CCR5 gene enables HIV to enter and infect immune system cells. Scientists have long searched for ways to block this pathway to protect people from HIV. However, critics say there are many other ways to protect people against HIV and expressed bafflement at why He would chose this as the first scenario to try creating genetically modified human babies. A group of 122 Chinese scientists issued a statement calling He's actions "crazy" and his claims "a huge blow to the global reputation and development of Chinese science." He is now facing investigation by a local medical ethics board to see whether his experiment broke Chinese laws or regulations. The university where He worked issued a statement that officials were "deeply shocked" by the experiment, which it stressed was conducted elsewhere. He, the statement says, has been on unpaid leave from the university. In a statement posted Tuesday morning, China's National Health Commission said it had "immediately requested the Guangdong Provincial Health Commission to seriously investigate and verify" He's claims. CRISPR enables scientists to make precise changes in DNA much more easily than before. The technique is revolutionizing scientific research and raising high hopes for major breakthroughs, including preventing and treating many diseases. But making changes in human DNA that could be passed down from generation to generation has long been considered off-limits. One reason is that a mistake could introduce a new disease that could be passed down for generations. Another is that it could open the door to "designer babies" — children that are modified for nonmedical reasons, such as to be taller, stronger or smarter. Other scientists have previously used CRISPR to edit genes in human embryos and are continuing to explore ways to correct genetic defects in embryos. At the summit, Paula Amato of the Oregon Health & Science University in Portland Ore., said her group planned to try to correct defects that increase the risk for breast cancer and Huntington's disease. "If this ... process is ultimately determined to be safe, why wouldn't we want to do this?" she said. But no one had ever attempt to implant edited embryos into a woman's womb to allow them to develop into babies, and other scientists still maintain that it is far too early to be trying that.